PLN's often form themselves organically. PLN's are rhizomic. There is no central root system. There is only one connection leading to another. Whitby best sums it up by calling it a 'mindset', a way of being. This 'way of being' also goes far beyond the usual digital connections. Just as Couros suggests that everything can be a resource, we can say the same about all the different links in our lives. I believe that everyone in our lives has a point of knowledge to share, if recognised. The other day my wife and I went and visited her grandparents. As is the usual, I ended up chatting with her grandfather about anything and everything. I love these conversations as no matter how many chats we have, there is not a time when I learn something new from him about such topics as farming, fire fighting and the family history. Whether it be about communicating during a fire or the way that the various properties were divided. Although many of these situations do not impact me directly, the problem solving and reasoning behind them does. Solutions for today can so often be found in adapting and extending ideas from the past. A part of this is limiting ourselves by failing to recognise the connections in our lives and what they may have to offer. One way in which we restrict these connections is by deciding what it is we want to know, before we have even asked the question. With this comes a decision who will best provide this answer. Fine that if we have a question about how to create a character for a story, the best person to ask may be an author. This does not really give voice to those divergent thinkers, those may not be professional writers, but people with a passion for writing and creativity. Sometimes the best answers I get from my PLN are from those who I didn't expect. Is their opinion any less valuable? Another good example where perspective and divergent thinking is so important is in education. Christopher Pyne, the Australian Minister for Education, recently made the statement that "everyone has been to school, everyone is an expert on education in one way or another." Now I'm not sure that I agree that everyone is an 'expert', however, I do think that Pyne is on to something. Although not everyone is an expert, everyone does have an opinion and something to add to the discussion. In my view, education is much better from incorporating wider range of voices and perspectives. +Miguel Guhlin sums up this problem in a great post about mandated technology in schools. Guhlin calls for a infinite plurality. That is, rather than collective uniformity, where everyone does this or uses that, it is about developing common practises from a range of diverse perspectives. In closing, he moves his discussion from technology to PLN's. I'd hate for my PLN to all be the same person with one message. Better than strict adherence to one technology over another, a plurality of diversity that builds relationships among diverse partners to achieve common goals. When Guhlin talks about plurality in regards to PLN, it is about capturing a range of perspectives with the focus being the goals that we may share. I think that it sometimes misses the point to base your PLN upon people that we like or those who we get along with. To build upon +Tom Whitbys point that "PLN's accept people for their ideas, not the titles." I think that PLN's accept ideas, not people or personalities. The bigger challenge is how we actually recognise such differences in a meaningful way. 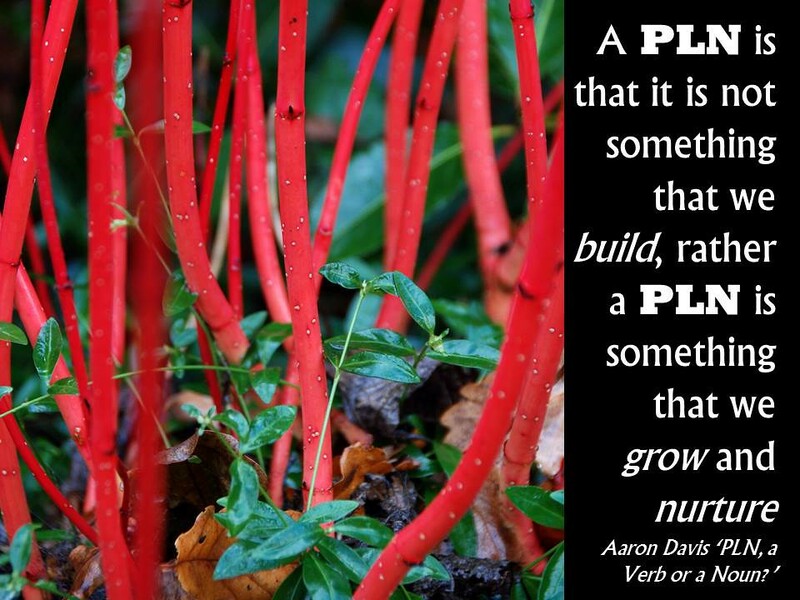 I think that something that is often overlooked in regards to a PLN is that it is not something that we build, rather a PLN is something that we grow and nurture. Being something organic, its success often depends upon the way we treat it. For example, if you simply plant something and leave it to the elements, then you cannot be surprised if it does not take. However, if you choose where to setup your garden bed, lay some straw, water regularly and add some nutrients, then you are providing more opportunity for things to grow and prosper, to flower and reproduce. I think that a PLN is much the same. One of the difficult problems with any discussion about PLN's is that people are often encouraged to connect with others. What is often overlooked though is that connections are not a one way transaction. They are reciprocal in nature. Too often connecting is seen as a way of getting an answer, an resource, a piece of information. However, if no one is willing to offer an answer, then the whole system falls apart. There are a number of ways in which a PLN can be nurtured. This includes engaging in dialogue, posting comments, as well as sharing ideas and resources. But the most important thing that we can do, whether it be in person or online, is to listen and simply be there. I have read quite a few people who have suggested blogging as their 'goal' for 2014. This sums up the greatest conundrum associated with being connected. Often people associate being connected with doing this or that. Creating a twitter account, joining a Google+ group or blogging more. I am not saying that these things are not important, but they in part miss the point. In the end, you don't measure the success of a blog by the amount of hits it gets, nor do you measure a PLN by the number of followers someone has on Twitter. Being connected is a mindset, a way of being and a way of doing, not something static, that is a thing done and complete. What are the areas that you are passionate about, have an expertise in, have an opinion on, know something about? How are you sharing this with others? In what ways are you nurturing your PLN?